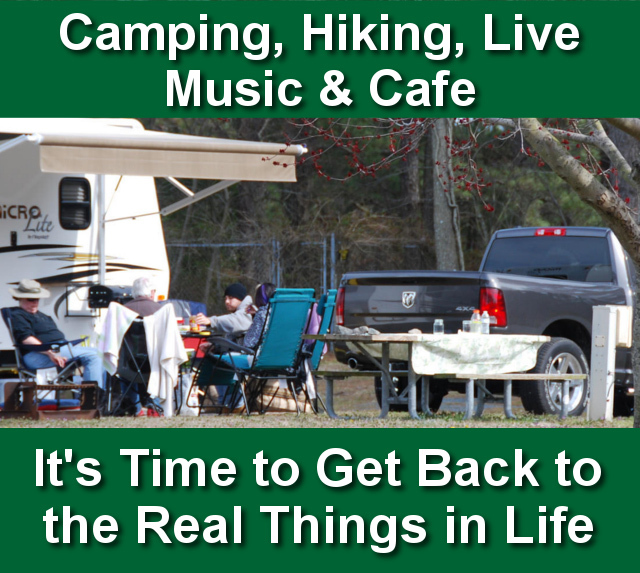 Everyone must check-in to office before entering campground. 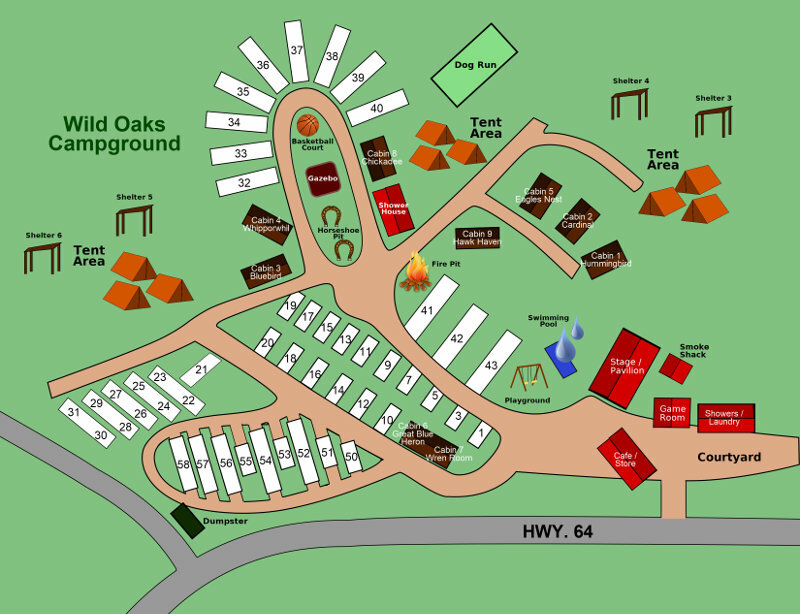 Please note: anyone visiting you during your stay at Wild Oaks is required to purchase a $5.00 day pass per person. This helps cover our costs for the pool, shower house, electricity, & dumpster use. Most Important Rule of all…HAVE FUN!!!! Please Note: All reservations require an active credit card to hold the site. We require a one night deposit, and the rest is due upon your arrival. Refunds on deposits are forfeited without a ten day notice of cancellation. NO EXCEPTIONS! There is a two night minimum on weekends(Memorial-Labor), Three night minimum on holiday weekends. Sorry, we do not give refunds for rain outs, but there’s no extra charge for sunshine! No refunds for early departure. Please note: You will be charged an additional fee up to $500 for any damage that occurs while staying in one of our cabins. We have five comfortable yet rustic sleeping cabins complete with comfy beds, cool air conditioners and toasty heaters (depending on your preference). Though they have no bathrooms of their own, for your convenience there are two squeaky-clean shower houses close by. For a more modern stay, two of our cabins do have bathroom facilities. No matter which cabins you choose, you will want to bring your own bedding, towels and toiletries. 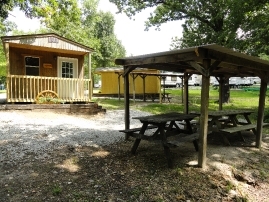 This small cabin is located directly behind the pool, facing out toward the middle of our campground near the playground. Inside you will find: a bunk bed with a full size mattress on both the top and bottom bunks, and a table with chairs, air-conditioning/heater, picnic table, grill and fire-ring. This cabin is roomy and comfortable. The front door faces the horseshoe pits and basketball court, and then in the back you will find a shelter nestled among a beautiful,private wooded area. Inside the cabin you will find: a bunk-bed with a twin size mattress on the top and a full size mattress on the bottom bunk, a sturdy, rustic futon with a nice thick full size mattress, a table with chairs, air-conditioning/heater, picnic tables, grill and fire-ring. This cabin is longer than the others; it is one large room. The front door faces a shelter nestled among a beautiful,private wooded area.Inside the cabin you will find: two (2) bunk bed sets with a twin size mattress on the top and a full size mattress on the bottom bunk, as well as, a sturdy, rustic futon with a nice thick full size mattress, a table with 4 chairs, air-conditioning/heater, 2 picnic tables, a grill and fire-ring. 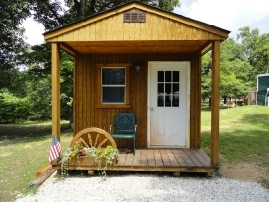 This cute little cabin looks out to the open middle, near many of the campground amenities and closest to the bottom shower house. Inside you will find: a plush queen size bed, and a sturdy, rustic futon with a nice thick full size mattress, a table with chairs, air-conditioning/heater, picnic table, grill and fire-ring. This Cabin is made more for those who look for “Clamping”. A very Comfortable place to hangout with all your friends or family. Inside you will find two separate bedrooms , with quality queen size beds, divided by a half bath. And then a great room—one side houses a bunk bed set with a twin on the top and a full size mattress on the bottom. a sturdy, rustic futon with a nice thick full size mattress, a table with chairs, air-conditioning/heater, electrical outlets, 2 picnic tables, grill and fire-ring. This is a fancy, fully handicapped accessible room, furnished with a full bath and shower and concrete pad for an even surface for easy walking and rolling a wheelchair. 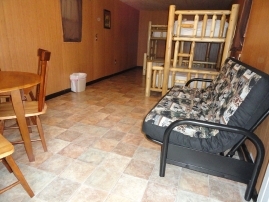 This Cabin is great for older folks who want to enjoy the camping atmosphere with a motel room experience. Inside you will find charming, rustic décor with a large comfortable queen size bed, as well as, a sturdy, rustic futon with a nice thick full size mattress, with a table and chairs , air-conditioning/heater, a picnic table, grill and fire-ring.